From Address (7 Sep 1903), at the State Fair, Syracuse, N.Y., collected in Addresses and Presidential Messages of Theodore Roosevelt, 1902-1904 (1907), Vol. 1, 241. I am a firm believer in the theory that you can do or be anything that you wish in this world, within reason, if you are prepared to make the sacrifices, think and work hard enough and long enough. From Cameron Prize Lecture (1928), delivered before the University of Edinburgh. As quoted and cited in Editorial Section, 'Sir Frederick Banting', Canadian Public Health Journal (May 1941), 32, No. 5, 266-267. I find I’m luckier when I work harder. One never knows how hard a problem is until it has been solved. You don’t necessarily know that you will succeed if you work harder or longer. 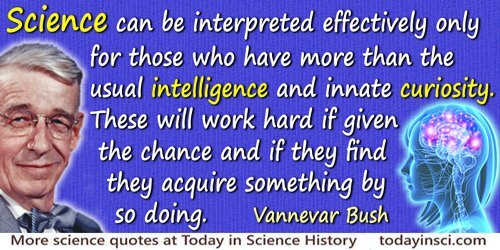 Science can be interpreted effectively only for those who have more than the usual intelligence and innate curiosity. These will work hard if given the chance and if they find they acquire something by so doing. (1940). Epigraph, without citation, in I. Bernard Cohen, Science, Servant of Man: A Layman's Primer for the Age of Science (1948), xi. Also seen epigraph, without citation in Science Digest (1950), 28, 17.